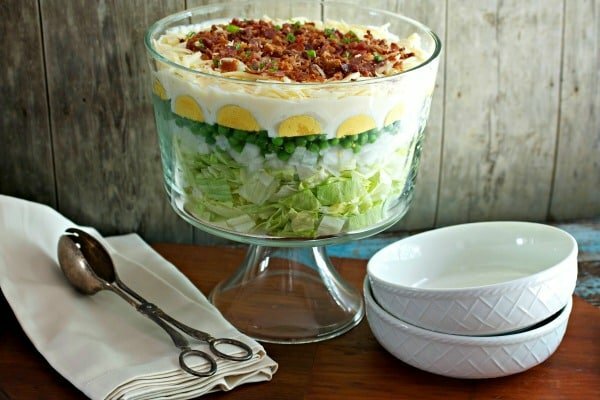 A recipe for a Southern classic Easy 7 Layer Salad that’s perfect for family gatherings. 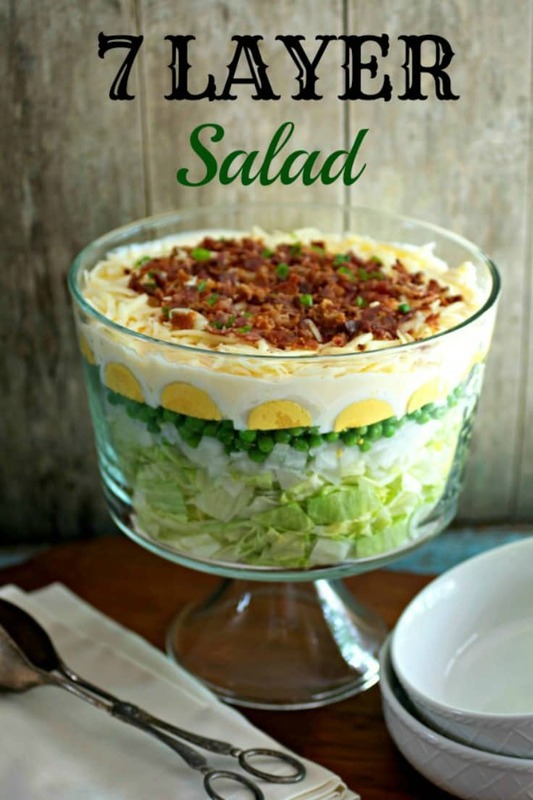 Delicious layers of lettuce, sweet onion, green peas, hard boiled eggs are topped with a homemade dressing, cheddar cheese, and crispy bacon! Need a delicious salad/side dish for a Fourth of July cookout this coming weekend? Try this easy (and my family’s favorite) 7 layer salad recipe! You can’t beat a good seven layer salad recipe. Recently, I made it to celebrate the end of my sugar detox. After all, it looks healthy with all the multiple layers of fresh, raw veggies, except it’s all slathered in a dressing made of white sugar and mayonnaise. Yes, I just said white sugar and mayonnaise. Two ingredients that should never be mixed together in the same bowl and poured over perfectly fine, completely edible, raw vegetables. The flavor truth lies within this creamy sweet mayonnaise dressing. It pairs perfectly with the crispness of the iceberg lettuce and the starchy pop of the green peas. Additionally, the crunch of the raw onions with the tasty toppings of salty bacon and sharp cheddar cheese is absolute heaven. A easy 7 layer salad recipe is excellent at feeding a lot of people and can easily be made ahead of time. Make it the day before and store, covered, in the refrigerator. Don’t worry about it getting soggy, because the dressing layer will keep everything underneath it fresh and crisp. One of the things I love about an easy seven layer salad recipe is it’s versatility. The ingredients can vary depending on what veggies are in season or just use your favorites. 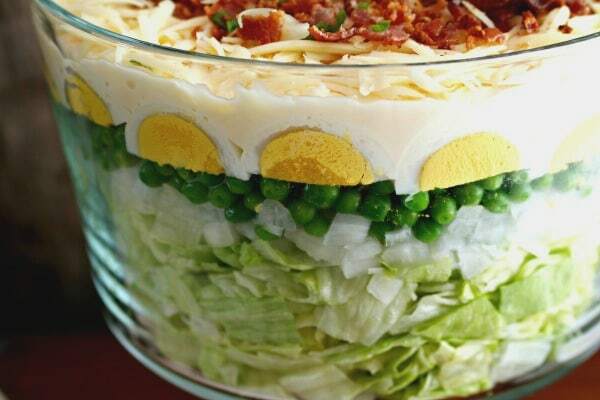 There must be four layers that are, what I consider, the salad’s classic ingredients: lettuce, peas, hard-boiled eggs, and the sugar-mayo dressing. The other three can be personalized to your liking. 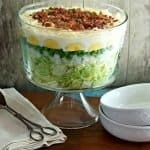 So when you need an easy side dish recipe, make this Easy 7 Layer Salad for holiday cookouts, barbecues, or any other special occasion. Enjoy and please let me know in the comments below what salad layers you used! 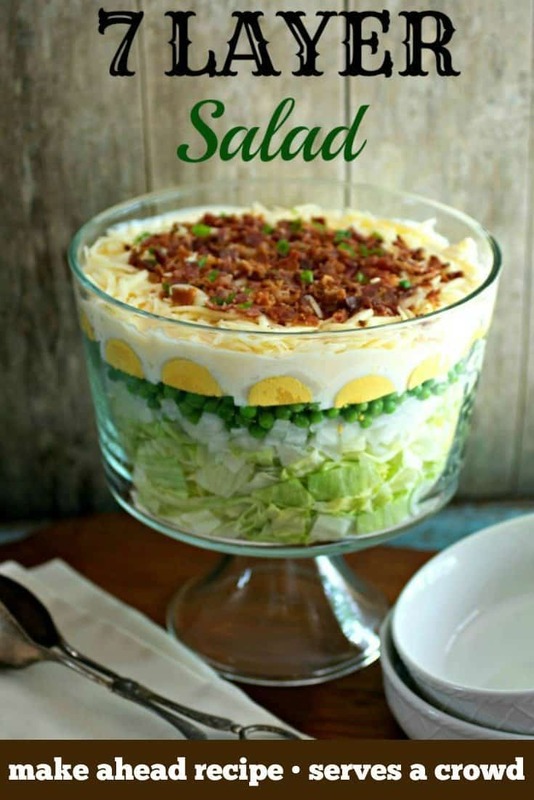 A recipe for the classic Southern easy 7 layer salad that's perfect for family gatherings. Delicious layers of lettuce, sweet onion, green peas, hard boiled eggs, and topped with a homemade dressing, cheddar cheese, and crispy bacon! In a small bowl, mix together the mayonnaise and sugar to make the dressing. Set aside. Using a 9x13 glass baking dish or trifle bowl, layer the salad in the following order: lettuce, onion, frozen peas, and sliced eggs. Completely cover top of salad with the dressing. Sprinkle top with the cheese and bacon. Cover with plastic wrap and store in refrigerator for at least 8 hours, or overnight. Hi Karrie!! amazing looking salad almost too pretty to eat! sounds like a great side for summer grilling! Thanks Gaila! It’s wonderful as a side dish to grilled meat or veggies. This looks SO good, Karrie! I love that it’s a 7-layer SALAD, and not a dip. I will definitely be making this for my next outdoor gathering! I’m all for the sugar mayo…just schmear it on! I like the fancy lettuce mix as much as the next person, but sometimes iceberg alone as in this salad is the best. I love its clean taste and crispiness. Nice job with the salad arrangement, Karrie. Thank heavens that sugar detox is over! Bring on the mayo and sugar! I love everything about this southern salad and could eat the whole thing myself. Perfect dish for a holiday weekend bbq! It looks so pretty in all it’s glorious layers too! That salad could be called “Salad Trifle”, ha-ha! Delicious stuff, indeed. Even though I’m not a huge fan of mayonnaise but it really works here. Good work, Karrie! This has a POUND of bacon….Do I even need to say anything else? I mean when you top ANYTHING with that much porky goodness, then it just has to be delectable! I am seriously craving this salad, right now. Will you please mail me….all of this? K, thanks. I love how simple the dressing is. When you have that many flavors going on in the actual salad, then you don’t need a super complicated dressing. YUMMY! Great presentation! This dish is perfect for a summer party. Tong, ta tong tong tong. Can I use anything else besides peas? This is my favorite salad! 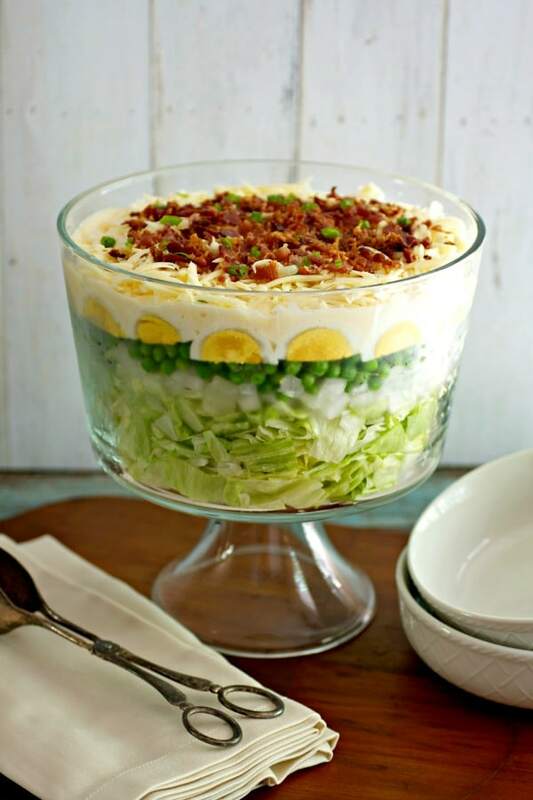 An ongoing family discussion: do you serve this salad from the trifle bowl or dump it in a big serving bowl and toss all the layers together? I cant find white sharp cheddar cheese at my local grocery store can i use mozzarella shredded instead? Hi Janet, yes you can use any kind of cheese in this salad. I think a mild cheddar or sharp cheddar works best in this because of the other ingredients, but really just use any cheese that you prefer. Hope you like the salad! Can I use miracle whip instead of mayonaise. I made this salad for Easter for my family. Mine wasn’t as pretty as yours, but it was a big hit. The flavor combinations were perfect. Everyone loved it. Thanks for the fantastic recipe! That makes me so happy that everyone liked it! Thanks Katie! I remember this salad, Karrie! It looks as amazing now as it did years ago! Yum!! Well, close the front door! Or shut the front door (whatever the cool kids say these days) this salad looks amazing! What a perfect idea for the upcoming summer BBQ and party season. I’m pinning for later! Thanks Christina and thanks for the pin! 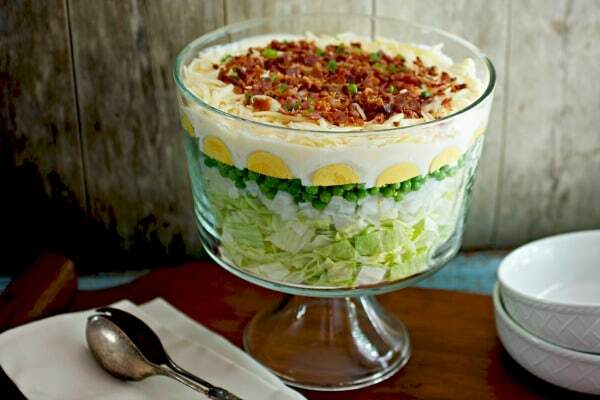 Your salad looks so pretty in the trifle bowl. I wouldn’t want to be the first to take a serving and mess it up. Hahahaha! Too true! It’s hard getting that first scoop out and keep everything so pretty. Thanks so much Karen. Well here we are in Jamuary and sib zero weather here in Mimnesota, and yet ot is always a good time for a good salad. I grew up with this 7 layer salad and I’m 74 years old… there is nothing better. When we lived in Texas for 4 years I introduced this wonderful salad to family members down there, they fell on love with it and now make it often themselves. I pulled this up to check to see if it had changed at all and so happy it hadn’t. Thanks so much for sharing! I feel your pain Wendy because it’s freezing where I am too! True, there is nothing better than a 7 layer salad. Whenever I try to explain to someone what this salad is, they don’t fully get it until they take a bite, then they understand it’s the best salad in the world! hahaha! Seriously, I love it and so glad you and your family does too. An all time favorite I had forgotten about til now. Gonna add it to my Easter dinner line up. We love this salad so much in my family too! Hope you have a wonderfully sunny Easter and enjoy the recipe Kathy!